Sofosbuvir is a medication used for the treatment of hepatitis C. Sofosbuvir was discovered in 2007 and approved for medical use in the United States in 2013. It is on the World Health Organization's List of Essential Medicines, the most effective and safe medicines needed in a health system. 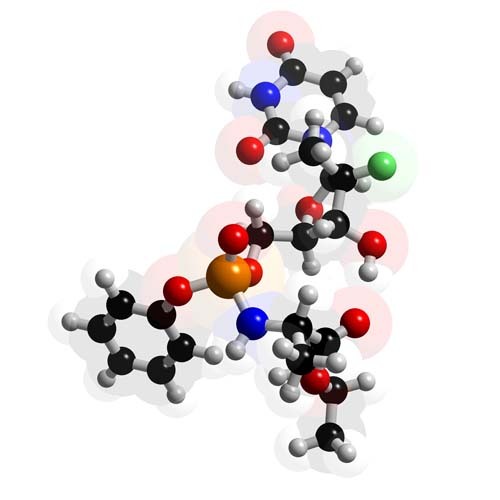 Sofosbuvir is in the nucleotide analog family of medication and works by blocking the hepatitis C NS5B protein. Sofosbuvir is a prodrug. It is metabolized to the active antiviral agent GS-461203 (2'-deoxy-2'-α-fluoro-β-C-methyluridine-5'-triphosphate). GS-461203 serves as a defective substrate for the NS5B protein, which is the viral RNA polymerase, thus acts as an inhibitor of viral RNA synthesis. Sofosbuvir in combination with velpatasvir is recommended for all genetypes with a cure rate greater than 90%, and close to 100% in most cases. The duration of treatment is typically 12 weeks. As of 2016 a 12-week course of treatment costs about US$84,000 in the United States, US$53,000 in the United Kingdom. The price has generated considerable controversy. In 2017, the range of costs per treatment varied from about $84,000 to about $50.